SHIMIZU S-PULSE: vs KASHIWA REYSOL (August, 13th, 2017) Live Coverage! Stay with us with the live report of the J1 League game (Game 22, return match) played in Nihondaira Stadium in Shimizu Ku, Shizuoka City between Shimizu S-Pulse and one of the top teams in the J1 League, Kashiwa Reysol! After the incredible comeback last Wednesday against the then leaders of the J1 League Kashiwa Reysol will not take that game lightly. We are in for a cracker! 1′ Corner kick for S-Pulse. Barely punched away by Reysol keeper! 3′ Dangerous counter attack by Reysol but shot wide above bar! 5′ Free kick for Reysol 35 meters away. Headed wide past left post. 7′ Reysol better organised than S-Pulse so far. 8′ Good double action which forces two saves from goal keeper! 16′ match getting a bit dull. 19′ Great chance wasted by Hasegawa alone in front of goalkeeper! 20′ Great save point blank by SPulse keeper who parries away great heading! 21′ very dangerous cross by S-Pulse! 24′ Shot wide over Reysol’s bar by Duke! 29′ S-Pulse creates a half chance but the final execution is too imprecise! 32′ Free kick for S-Pulse 23 meters from goal in far right. Aborted by off-side. 34′ Dangerous center kick by Reysol ending in corner kick. Inconclusive. 37′ Very dangerous S-Pulse long rang shot barely pushed into corner kick! Wasted. 40′ Left corner kick for Reysol. barely saved by a SPulse leg! A unfavourable rebound by the Reysol defense and a blunder by the S-Pulse defense gives away a silly goal a bit against the run of play well taken by Reysol’s Ito! A first half time very unequal, exciting at times, dull the rest. Reysol took well a gifted goal a bit against the run of play. S-Pulse will have to show more precision and sharpness if they want to wrest away this disappointing. Will Reysol play safely or press S-Pulse? See you in the second half! 46′ Kick off by Reysol. Very dangerous center kick by Reysol! Quick attack by S-Pulse ends up with Kanata beating the Reysol keeper with a neat shot across the goal! 52′ Splendid long-range effort by S-Pulse barely parried into corner kick! Inconclusive and very dangerous Reysol counter attack! 53′ Corner kick for Reysol. 57′ The S-Pulse defense again almost gifting a goal! 59′ Kitagawa in For Duke for S-Pulse. 62′ Very dangerous center rolling in front of S-Pulse goal. Corner Kick. This time Reysol took advantage of S-Pulse poor defense with YUN Suk Young slotting an easy goal in! 68′ S-Pulse falling back into their bad habits playing in a handkerchief. Murata in for Edamura for S-Pulse. 74′ Good attack by S-Pulse but heading over the bar. On the counter attack Christiano finds himself alone in front of goal and doesn’t make a mistake! 81′ Dangerous free kick for Reysol. Headed away. 83′ Poor finish again by S-Pulse. Hosogai for Otani for Reysol. 89′ Corner kick for S-Pulse. Poor finish that epitomizes the day for S-Pulse. Nakagawa in for Nakatani for Reysol. 90′ Corner kick for Reysol. Punched away. A game to forget for S-Pulse! Reysol took their last chance during the first half and had only to control the game in the second half taking S-Pulse flat footed almost at will, especially on the left side. Reysol was clinical and mature, S-Pulse was febrile and childish. 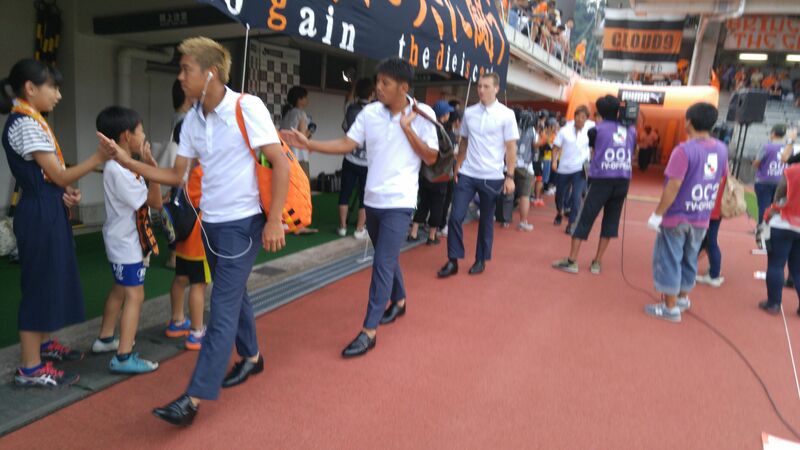 More was hoped from the Shimizu guys after the incredible win last Wednesday. Let’s hope for a better show next game! The season is still not safely away! Previous PostManhole Covers in Shizuoka Prefecture 48: New Rescue Kinghishers Cover in Shizuoka City!Next PostSHIMIZU S-PULSE: vs URAWA RED DIAMONDS (August, 27th, 2017) Live Coverage!